Inventaprint is a marketplace for hardware development. The platform connects innovators and businesses to a vetted network of designers and manufacturers to bring ideas and hardware products to life. Inventaprint catered to single proprietors, but were ready to scale their product to meet the needs of their new target users; bigger organizations that needed help with the hardware manufacturing process. 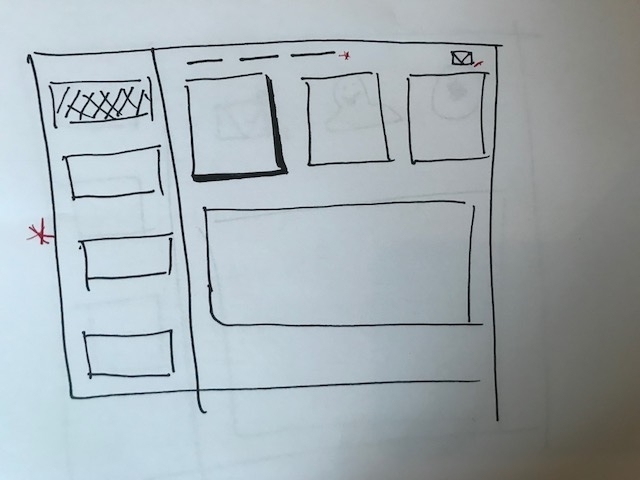 Additionally, my team and I were responsible for uncovering areas of opportunity where we could improve the usability and utility of their platform. 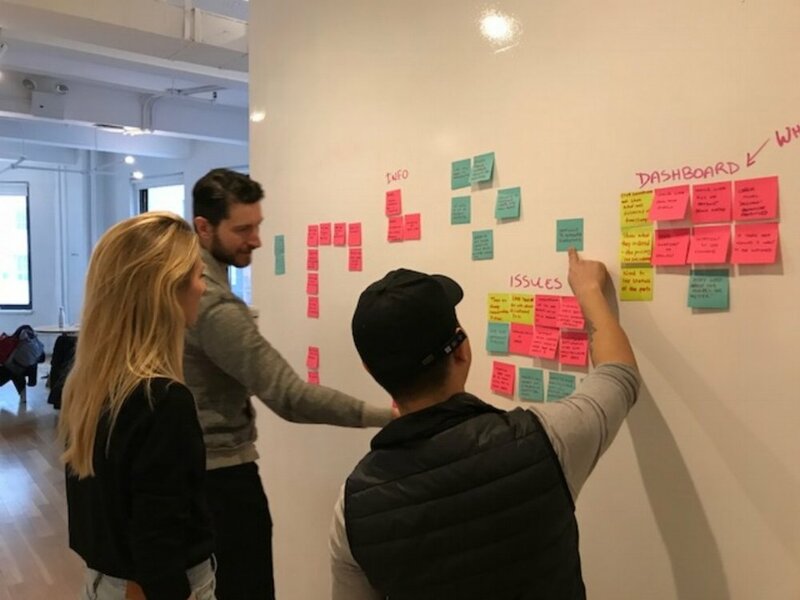 Based on research and usability test insights, my team and I uncovered opportunities to streamline the user’s journey from initial project submission to hardware shipment. As a result, we redesigned the platform’s information architecture, interface and implemented additional features. The goal was to understand the user’s process of having their hardware manufactured. With this information, we thought we could improve the utility of the product, by providing features to increase user adoption and engagement. Users that have not used the platform and have experience in working with manufacturers. My team and I performing an affinity map to uncover trends from user research. Shapeways and Quirky are open-market platforms that allow users to manufacture their products by uploading their designs and ideas to partnered manufactures. Once produced, users have the option to sell it on the platform's marketplace. While examining these 2 platforms, we've noticed these platforms offered a community, which we believe would increase user engagement and adoption. However, we've learned that this idea goes against Inventaprint's closed-marketplace policy, so this feature was implemented. How might we facilitate communication, build trust, accelerate and illuminate the process of manufacturing between innovators/businesses and manufactures? 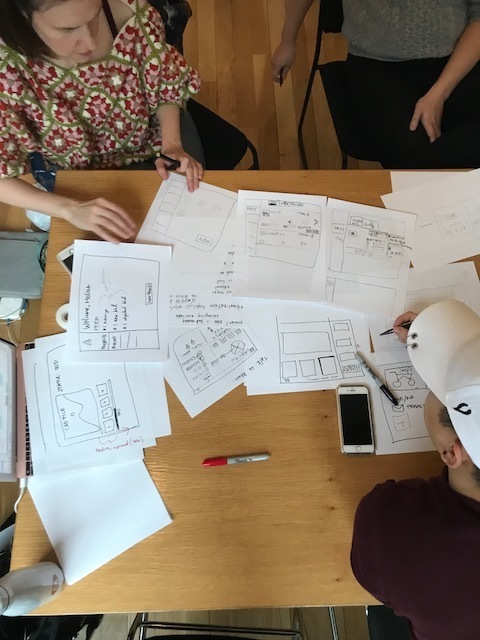 Our design team collaborated with the web development team in a series of design ideation sessions to uncover solutions that were intuitive, logical and feasible. 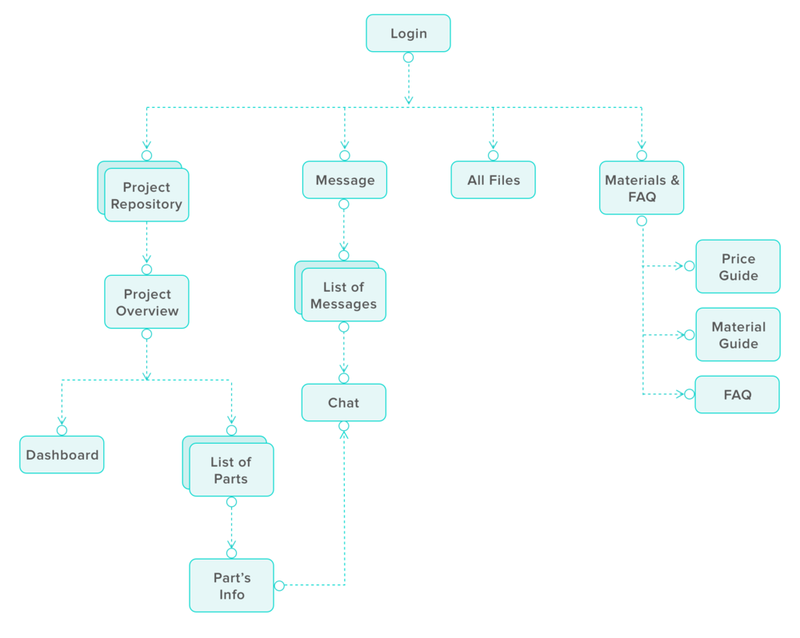 The existing information architecture could not provide a robust framework to implement our solutions, so we decided it would be best to reorganize the structure. Here is the existing product's information architecture. And the new information architecture of the platform. The following features were implemented to meet the needs of the client and users. The client expressed the need for their new target users to be able to organize their projects into “epics”. 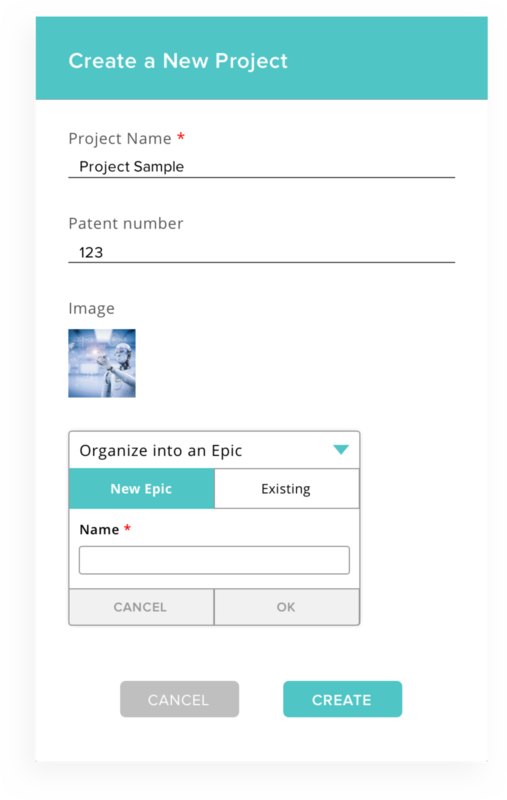 So, we added a feature in the Project Creation modal that will allow users to ability to organize their projects. We refreshed the dashboard within each project’s page with additional features to inform users the progress of their parts and an overview price chart to indicate how much the parts were costing users. Our team implemented a color coded progress chart to give users a quick snapshot on the progress of all of their project’s parts. If the user sees that a part has been in a state for too long, they may take action by messaging their manufacturers to receive an update. This overview price chart was implemented because users wanted to know how much the project is costing them. 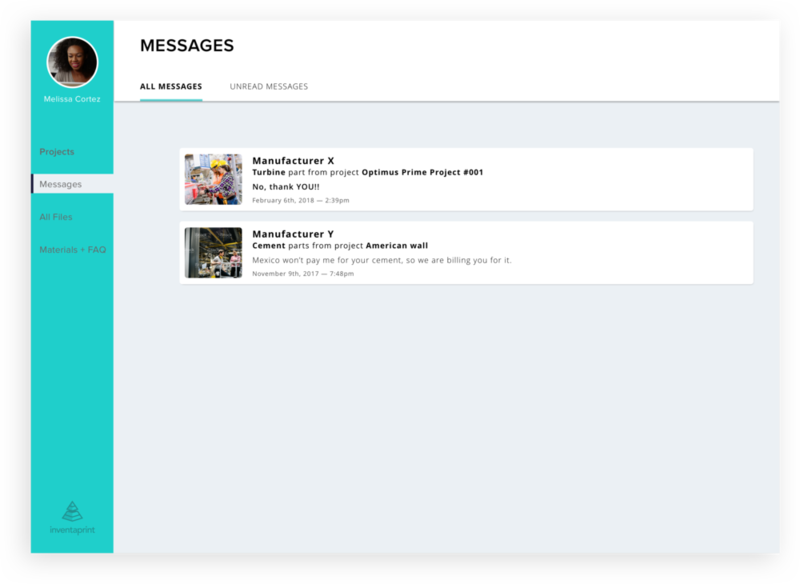 Users needed to be able to contact their manufacturers, so we designed an on platform messaging system. "Danny consulted on a UX/UI update project for the Inventaprint platform. 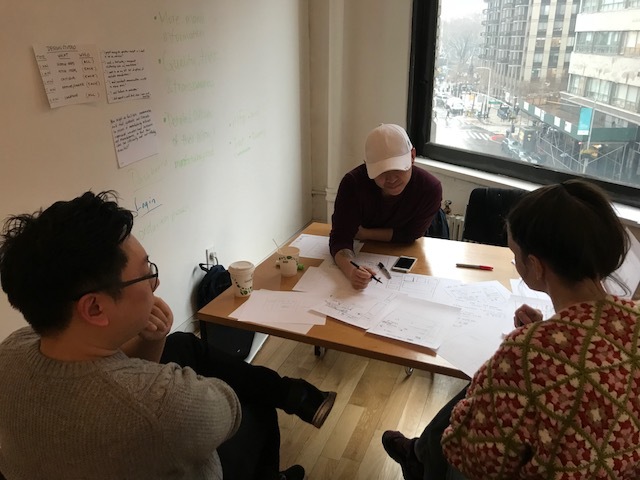 Danny did a great job in conducting user research, identifying key value added features, and develop an improved user experience. Danny went above and beyond the project scope to deliver quality work which will be instrumental in the new Inventaprint platform design and platform development. Danny possesses a creative mind and strong critical thinking skills. He will be a valuable asset to any team/organization."